What made your business successful yesterday will not be what makes it successful tomorrow. 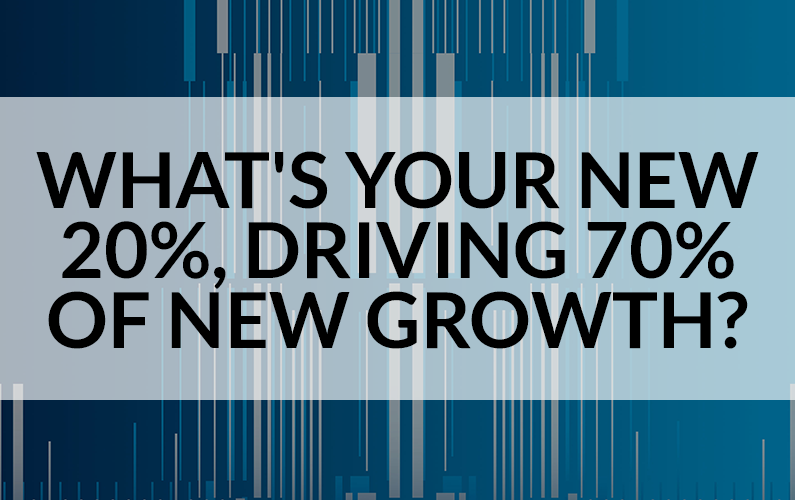 The 20% of capabilities – whether people or process, software or skill-sets—that has driven the majority of your growth to date will be different from the new 20% that drives the 70% of your new growth tomorrow. Don’t take my word for it. Just look around and ask yourself: what’s driving the “topple rate”—the rate at which companies fall off, or ‘topple’ from the Fortune 500 or Global 2000 list? Or, for those that have either stayed on it, or even moved up higher on the ranking, what has driven their momentum? And what capabilities (skill-sets, behavioral patterns or technology assets) have been critical to do so? For those who “topple,” is it over-reliance on the set of capabilities that made them successful in a competitive world that no longer exists? For those who don’t, is it partly a result of a shift towards a new set of capabilities in a changed competitive world? The stark example between Blockbuster and Cisco around the same time period highlights this difference. For the former, expanding more physical outlets missed the shifts of value in a digital world where the marginal costs of customer acquisitions fall nearly to zero. For the former, that recognition led to a re-focus away from manufacturing routers to the development of standards to connect everything irrespective of who made it. With what implication? For Blockbuster, adherence to the capabilities that had made them successful for so long and for Cisco, recognition that their new 20% would lie less with manufacturing and distribution and more with design and architecture capabilities. For Blockbuster, the result was to go out of business. For Cisco, a renewed growth curve for the next 10 years. In short, there is a decay-rate—or half-life—of the competitive relevance of an organization’s capabilities. Stated differently, the competitive value of any product or service and the capabilities underlying it (skill sets, behavioral patterns or technology assets) lessens over time; they have been decaying at an accelerating rate over the past twenty years. Technologies advance. Markets shift. And customer expectations change—creating pressures (and opportunities) about what to do and how to do it. The competitive half-life of products, services, skill sets, processes, and strategies is decreasing—with competition and the acceleration of change increasing. Recognition that the 20% that made you successful up to today will not be the same as the ‘new 20%’ critical to capture 70% of new value tomorrow. Identifying a new 20% is necessary (particularly as new competitors pass you by or put pressure on some of your key profit pools). Identifying “what” it needs to be prospectively is the challenge, and the opportunity.